Tobi Ishi is our favorite Japanese breakfast spot. 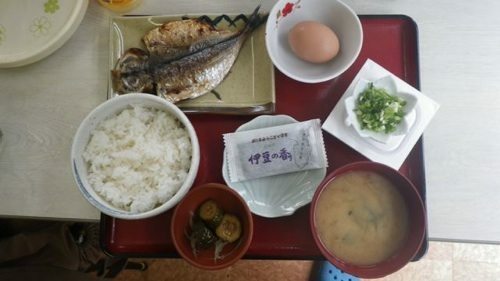 For 500 yen you get a perfectly grilled aji, rice, pickles, miso soup, an egg, and some nori (dried seaweed). If you don’t like your egg raw, the friendly obasan is happy to cook it for you. 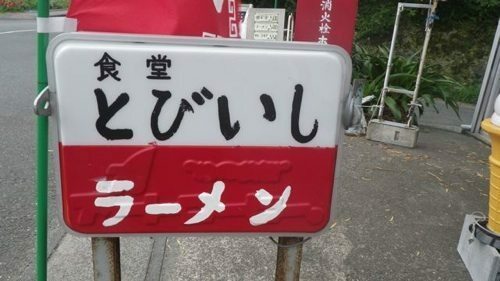 Natto is an extra 50 yen. She’s stays open late (weekends until 11 pm) and serves up other common Japanese dishes like soba, curry, and ramen. She’s got cold beer and a good selection of ice-cream in the freezer. This place hasn’t changed in years, perhaps 30, as the beer ads with women in highcut bathing suits reveal.Tobi Ishi is a 5 minute walk from tabi-tabi, you can also find it on our recommendation map here.